A recent paper in Emerging Infectious Diseases has provided full details of the national anti-TB drug resistance survey in Swaziland performed in 2009-2010. The results are quite alarming and there is detailed information within the report that should challenge us to rethink current strategies for diagnosis and treatment of drug-resistant TB not only in Swaziland but elsewhere in Southern Africa. The Kingdom of Swaziland is a small country (population 1,185,000) with the highest incidence rates of TB in the world. The estimated annual incidence of TB disease in 2010 was 1,287 per 100,000 giving an estimated 15,000 cases per year. Approximately 80% of TB cases are HIV-infected. Case detection rates and cure rates are below targets set by the World Health Organization. Case detection rate in 2010 was 66% (target 70%) and the cure rate for new smear positive cases in 2009 was only 51% (target 85%). In 2010 there were 326 confirmed cases of multidrug-resistant TB (MDR-TB), but only 2% of new cases and 35% of previously treated cases were tested for drug resistance. There is one laboratory performing culture and first-line drug susceptibility testing (DST), and second-line DST is performed outside the country. A nationwide cross-sectional survey was performed, enrolling 840 smear positive cases >14 years old from TB diagnostic centres. The cases were defined either as new cases (no previous TB treatment or anti-TB drugs for <1 month duration) or previously treated cases (anti-TB drugs for >1 month duration). The survey achieved excellent coverage, with about 84% of potentially eligible individuals screened for the survey. DST for first-line drugs (rifampicin, isoniazid, ethambutol, and streptomycin) was performed on all culture positive samples. DST for second-line drugs (amikacin, capreomycin, ofloxacin, 4-aminosalicylic acid (PAS), and ethionamide) was performed on isolates resistant to rifampicin and/or isoniazid. In addition, pyrazinamide susceptibility was tested for isolates resistant to any first-line drug and moxifloxacin susceptibility was tested for isolates resistant to ofloxacin. DST results were available for 633 patients (75% of those enrolled). The prevalence of MDR-TB in this survey was considerably higher than in the previous national survey performed in 1995. It is also considerably higher than reported from other Southern Africa countries. Botswana is the only country in Southern Africa to have performed regular national drug resistance surveys. As can be seen in the figures below, in the last Botswana survey in 2008 the prevalence of MDR in both new cases and previously treated cases had increased from previous surveys but not to the extent described now in Swaziland. This survey highlights the pressing need for improved diagnostic strategies for drug resistance. In this regard, it is encouraging that several initiatives to assist with TB control are in place within the country, e.g. the EXPAND-TB project and < a href="#MSF"> Medecins sans Frontieres. According to the WHO monitoring of Xpert MTB/RIF roll-out, Swaziland has procured 20 GeneXpert modules and 5,100 Xpert MTB/RIF cartridges with plans for further expansion of this technology. There are interesting details within this paper that could help to inform the use of Xpert MTB/RIF and which highlight some limitations of the technology. The detection of rifampicin resistance is considered a good proxy for the presence of MDR and this is supported by the evidence in this survey: the proportion of RIF-resistant strains that were also resistant to INH was 93.8% (122/130) so rifampicin mono-resistance was rare. On the other hand, the proportion of strains that were INH-resistant but not RIF-resistant was quite high (52 isolates, 8.2% of total). The implication of this is that if Xpert detects no rifampicin resistance and no other DST is performed, undetected INH resistance will potentially lead to poor outcomes and the emergence of MDR strains on standard first-line therapy. In terms of drug regimens for MDR-TB, the findings of high levels ethionamide resistance in the MDR strains should be of huge concern not only in Swaziland but throughout Southern Africa. Ethionamide resistance may partly arise due to cross-resistance from inhA mutations selected by isoniazid. Ethionamide is considered a key element of the standardised MDR treatment regimen yet this data would suggest that in half of all cases, it is likely to be an ineffective component of the regimen. WHO guidelines suggest that a standardised MDR regimen should consist of a fluoroquinolone, an injectable, ethionamide, and either cycloserine/terizidone or PAS. This data would suggest that ethionamide cannot be relied upon as an active drug and it might be necessary to include both cycloserine/terizidone and PAS in a standardised regimen. It seems that this is indeed the recommendation in the Swaziland national guidelines but South African guidelines are more in parallel with the WHO guidance. There is an urgent need in South Africa for up-to-date representative data to inform treatment guidelines. Although pyrazinamide is not considered an active drug in an MDR treatment regimen, it is recommended as a component of a standardised regimen to take advantage of its activity in an acidic environment (as in chronically inflamed lung tissue sometimes seen in MDR-TB cases). One also has to question this rationale if the drug will be ineffective in almost two-thirds of cases. This paper is very important and highlights the importance of surveillance for drug resistance. Better surveillance systems are required in many countries and there is a need to assimilate all the data to inform drug-resistant TB control strategies in the region. Sanchez-Padilla E et al. 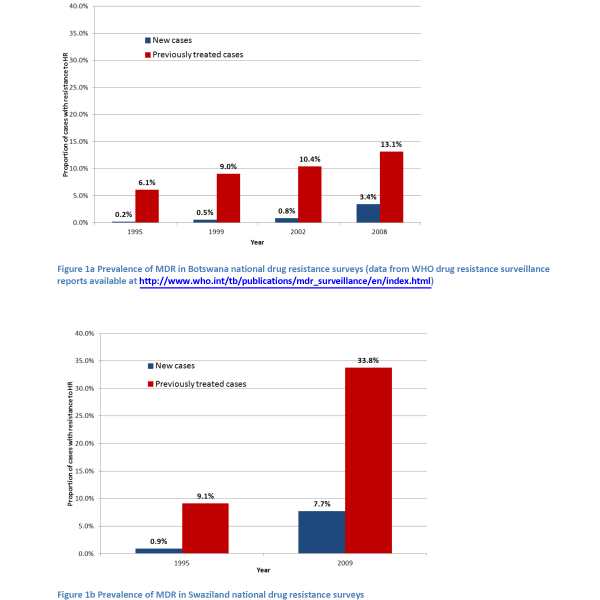 High prevalence of multidrug-resistant tuberculosis, Swaziland, 2009-2010. Emerg Infect Dis 2012; 18(1): 29-37. Medecins sans Frontieres in Swaziland. The WHO monitoring of Xpert MTB/RIF roll-out. Swaziland has procured 20 GeneXpert modules and 5,100 Xpert MTB/RIF cartridges with plans for further expansion of this technology.